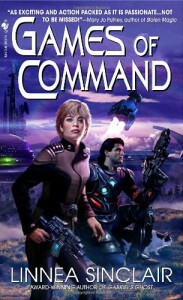 [b:Games of Command|352724|Games of Command|Linnea Sinclair|http://ecx.images-amazon.com/images/I/51AzoenBWyL._SL75_.jpg|342949] was a perfect mix of sci-fi action & some seriously intense romance. Kel-Paten’s been secretly in love with Sass for 12 years!, but must hide it since he’s a biocybe (basically a human turned robot – think Universal Soldier) and any display of “unnatural” emotion would lead to further removal of what’s left of his humanity. It never got too bogged down in tech talk or let anything too irreversibly damaging happen to any of the four main characters – my two biggest problems with most sci-fi.